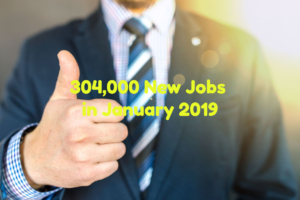 US Job figures were published today showing that the economy added a stronger-than-expected 304,000 jobs in January compared with economist’s forecasts of 165,000. However, December’s jobs growth figure was revised to 222,000, down from an initial estimate of 312,000. In spite of that, the US jobs market has now added jobs for a record 100 months in a row. Wages rose by a seasonally adjusted 0.1%, in January, below economists’ expectations for a 0.3% monthly gain in hourly earnings. Our view is that this is an excellent result and at least shows for now, that the economy is still on a growth track. It will of course be interesting to see if these figures are ‘revised down’ or not next month. LOL – well we wouldn’t necessarily disagree about the ‘quality’ of jobs on offer – however one could argue that even a shelf stacking job is better than no job. It’s amazing how many new shelf stacker jobs there are.